I’ve been waiting years to try this beer. Years. I’ve had hundreds of pints of Guinness Draught, just like every other Irishman living in the Boston area, but until last night I had never experienced the other half of the Guinness line. I’m not talking about the stubby little bottles of slightly carbonated, super-bitter Guinness Stout that you usually avoid when you’re reaching for the Draught bottles. I’m talking about the Foreign Extra Stout, the Guinness that’s packed with extra hops and extra booze that was meant to last through the voyage to the Caribbean, Africa, and other ports of yore. The Foreign Extra Stout is a huge product for Guinness, but since WWII (Or prohibition, depending on who you ask) this offering from the lads at St. James Gate has been unavailable in the States. Unless you’ve traveled to Jamaica where it’s practically the national beer, or any other hot, malaria ridden reaches of the world where this Stout is safer than water, chances are that you haven’t experienced what many consider to be the best that Guinness has to offer. NOSE: Burnt, roasty toasty, touch of booze. Brown sugar? If your regular Guinness Draught is a 2 on the nose scale, this version is probably an 8. TASTE: Strong roasted coffee, chocolate, bitter in the middle. What sets this apart from anything you’ve ever experienced from Guinness is the hops. Tons of hops throughout give an incredible spiciness, mixed with bitter dryness. Where an Imperial Stout hides its ample hops with alcohol, this Foreign Export Stout lets them shine through. 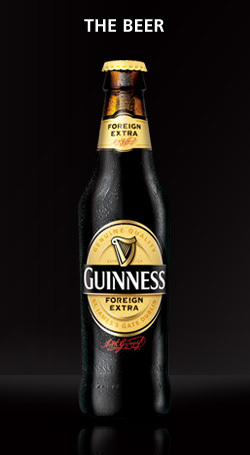 DRINKABILITY: Come on, it’s Guinness! Of course it’s drinkable. While not sessionable like the 4ish% draught version, I had no problem putting down 2 bottles back-to-back before moving onto something else. I still don’t understand why this beer gets more popular the closer you get to the Equator, but for a 20 degree night in Boston it worked out just fine. Is the FES better than the draught version that Aleheads around the world have known and loved? I really don’t know. I think it’s a better beer as far as complexity is concerned, but it’s tough to judge the two beers next to each other since they’re completely different styles and really brewed to produce completely different results. Who cares if it’s better or worse though? In the end, it gets you drunk (Actually, more drunk) and that’s a very good thing in my book. Slainte! Posted in Tasting Notes.Tagged 3.5 Hops, Foreign Extra Stout, Guinness, Ireland. I want to try this immediately, if not sooner. It’s impossible to compare this brew to Guinness Draught since Guinness Foreign Extra Stout is a high-end beer and Guinness Draught is sustenance. It would be like comparing a Porsche to your legs. Yeah, the Porsche is nice, but…I mean…I really need my legs. It’s actually not ‘impossible’… a Porsche is better than my legs. Or yours, for that matter.